Today was supposed to be a long bike ride to celebrate a big milestone at work. The weather is gorgeous and the days are long. Honing in on the cupboard I yank out the bottle of fish sauce: Three Crabs decorate the label. The last ingredient: hydrolyzed vegetable protein. The Internet says this is actually hydrolyzed WHEAT protein. Argh! They put the gluten in the fish sauce and then they lied about it on the label! The morning is spent lying low in bed, shaking and dozing, riding the waves. I wish I had a different body. More than anything I want to be free of this. Bella stays nearby to help; she seems to know. Those posts and bits of advice from GF gurus on the Internet. Go through the cupboards and the fridge, they say. Read the labels and throw out EVERYTHING that could have gluten hiding in it! At least your own kitchen will be safe and you won't accidentally poison yourself. The pantry purge idea, at first I found it a little absurd, maybe even extreme. Throw out food? There's still someone who can eat gluten in the house. Maybe I'll even get better and be able to eat it again, someday. Check EVERY label? Fish sauce can have gluten? Well I totally get it now. On board. First things first, the problem at hand. Digestive enzymes for gluten, probiotics, and diatomaceous earth. Lots of water. Banana with peanut butter. Dessert from last night, that's sweet and smooth and full of calories. (Vegan GF chocolate mousse from good friends!) Restock the liver with glycogen, have a nap, slowly recover. Instead of riding somewhere on a gorgeous road, I'm indoors reading search results and shopping to keep this from happening again. 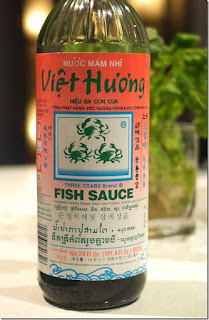 A gluten-free brand of fish sauce, which is most of them. (Three Crabs got the lowest taste score, anyway.) One bottle, why not two? Buckwheat flour, 100% buckwheat soba noodles. Most buckwheat pastas have wheat but on the Internet you can find the ones that don't. Coconut aminos, because umami is necessary and important. Fill up a box, $50 for free shipping. Gluten-free is expensive and inconvenient, and failure is lurking everywhere.